My baby is nine months old. Nine months! And she has been that way for five days. I almost teared up typing that. Seriously,this little girl is a ball of fire. She is curious, full of personality, and constantly on the move. But, really, you can't get her to hold still for anything. Diaper changes have become near impossible, and I tempted majority of the time to let her streak through the apartment with a naked bum instead of chasing her down and attempting to pin her to the ground. Pictures are a fight; she really does smile. In fact, she smiles the majority of the day, but for the camera she refuses to look, or sports her stone cold face. Lady always seems to have important business to attend to. She moves with speed and determination to get to where she's apparently got to be (usually this means wherever she's not supposed to be). The day before her nine month birthday she taught herself to climb the stairs. With that knowledge (and no warning) my life became that much harder. Oh, boy. She has also discovered that every drawer and cupboard in the apartment contains something. Party for Lady. Those rare moments when she can be caught sitting still, her legs are crossed. Always. When someone says, "So big!" Abby raises her arm arms over her head. She finds her sneezes hilarious, and a giggle always promptly follows a sneeze. She babbles constantly, and when she thinks she is not being heard she yells (or rather, shrieks). During her ninth month of life, Abby took up a fascination with books, and I sighed a ginormous sigh of relief. She had shown little to no interest up to this point, but maybe my baby will have the love for reading I always dreamed of. She can often be found looking a the books, mumbling to them, and then chewing on them. The cycle repeats. Though she seems to have adopted my love of literature, she is still a daddy's girl through and through. She adores him. Though I hate to admit it, she often babbles "dadadada." At first, I tried to dismiss it at simple babble, but she says very clearly when he comes home from work, leaves a room, or even when she hears his voice through the phone, "Dada!" Though it makes me want to cry, I'll admit it's adorable, so I encourage it. Abby still pulls herself into standing position anywhere and everywhere. Though the rocking chair remains her favorite perch. Sometimes, she'll let go for a moment, standing on her own, but she quickly realizes what she is doing and grasps her landing for security. She is a goofy child, always pulling faces, then chuckling at her own hilarity. Abby still sleeps like a champ with two naps a day and usually is ready to retire to bed around 7:30 pm. She sleeps for an average of 12 hours. Oh, how I adore her schedule. Except when the schedule needs to be broken, everything breaks loose, and she becomes unmanageable. She also eats like there is no tomorrow. She especially loves things she can feed herself. She adores avocado banana, and any other finger food I can give her. As I mentioned, she has developed a love for books. Her other favorite toys currently include the remote, my hair, and my hair brush. This child, I tell you. She is so curious and wants to touch (or lick) everything. Her hair is coming in nicely, and despite my constant efforts to get it to go curly (which it does right out of the bath), it ends up stick straight within minutes. She usually refuses to allow me to put clips in her hair, so we battle with the headband. Her hair makes a nice, awkward puff around the edges of the headband. Abby is growing like a weed. Weighing in at a whopping 19.9 pounds she is in the 70th percentile. 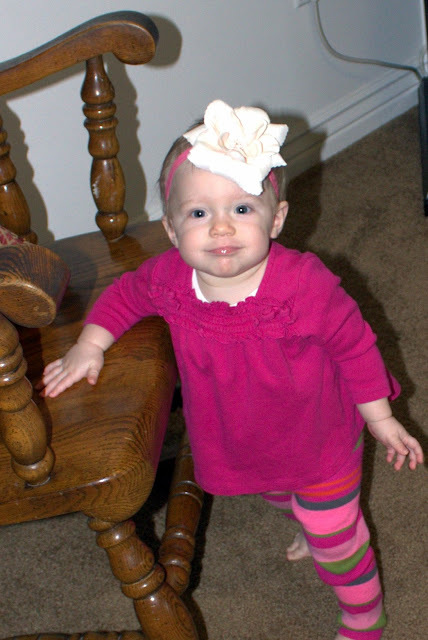 She remains in the 97th percentile for height and her head is off the charts. In fact, at her nine month appointment, the nurse gathered her stats, then re entered the room a minute later, confirming her head to really be that size. Oh the mother's guilt, I passed on my overly large head. If I had to describe Abby in one word at this point in her life it would be: mobile. She loves to be on the go. In the car, shopping, climbing, crawling. She's got places to go and people to see. She's my buddy during the day, and Dustin's in the evening. We are trying to force myself to remember the little things, like how she lays her head on a pillow, blanket, or cushion whenever she is tired, or how she seems afraid to sit on the floor when she is standing - like she doesn't realize she is really not that far from the ground. If only time could stop, even for a moment, so we can soak it all in.